The X-band radar market is projected to grow from USD 4.58 Billion in 2016 to USD 5.61 Billion by 2021, at a CAGR of 4.1% during the period. This report covers the forecast of the market and its dynamics over the next five years, while also recognizing market application gaps, recent developments in the market, and high potential countries. The X-band radar market has been analyzed primarily on the basis of application (including defense, government, and commercial) through the period from 2016 to 2021, considering 2015 as the base year. The ecosystem of the X-band radar market comprises manufacturers, distributors, and end users. The key end users of the market are the defense sector, government, and commercial sector. The designers and manufacturers of X-band radar are Japan Radio Company Limited (Japan), Terma A/s (Denmark), Northrop Grumman Corporation (U.S.), Raytheon Company (U.S.), Saab AB (Sweden), Furuno Electric Co. Ltd. (Japan), Israel Aerospace Industries (Israel), ThalesRaytheonSystems (France), Selex ES S.p.A (Italy), Kelvin Hughes Limited (U.K.), Reutech Radar Systems (South Africa), etc. The global X-band radar market is projected to grow from USD 4.58 Billion in 2016 to USD 5.61 Billion by 2021, at a CAGR of 4.1% during the forecast period. Factors such as increasing crime in the form of territorial conflicts, emergence of electronic and network centric warfare, replacement of legacy systems resulting in the automaton of radar systems, and increasing use of the X-band radar in defense are expected to drive the growth of the global market during the forecast period, 2016 to 2021. On the basis of application, the global X-band radar market has been segmented into defense, government and commercial. The defense segment is projected to grow at the highest CAGR during the forecast period. The increasing demand for the X-band radar can be attributed to several factors such as the deployment of the X-band radar in naval as well as in civil, military, and government institutions for weather monitoring, air traffic control, maritime vessel traffic control, defense tracking, and speed detection of vehicles for law enforcement and so on. Procurement of the X-band radar by the defense sectors of countries has increased considerably over the past few years, mainly driven by the increasing number of wars against terrorist outfits, globally, especially in the Middle East and Asia-Pacific regions. There is also an increasing demand for the technologically advanced X-band radars, such as the Polarimetric radar, Long Range Discrimination Radar (LRDR), electronically scanned array radar, and solid state transmitters. The global X-band radar market by type is dominated by the mobile X-band radar segment, which is used for a wide range of applications, such as, to study the dynamics of extraordinary cyclones and cloud microphysics, urban rainfall, and sea breezes, among others. The mobile X-band radar segment is expected to grow at the highest rate in the near future. The demand for mobile X-band radars has been increasing across the globe, owing to increased usage in air traffic control, early weather warning, perimeter surveillance, and airborne surveillance. The demand for portable or mobile X-band radars in the North American region is growing at a rapid pace. This is due to the development of various new programs by the U.S. to devise an enormous defense system. The Raytheon Company (U.S.) has also developed the sea-based X-band radar for the naval surveillance application. 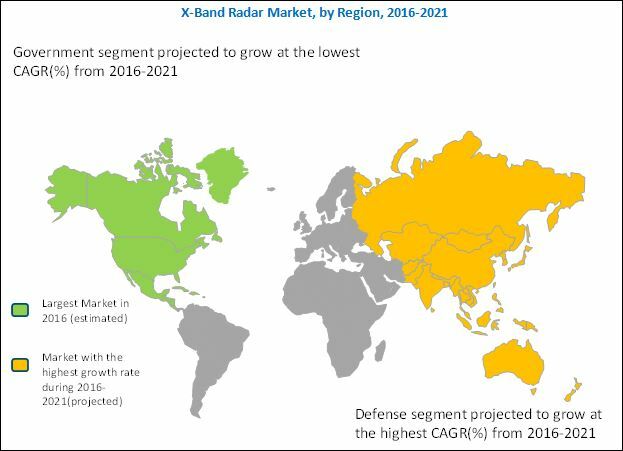 The Asia-Pacific region is expected to exhibit the highest growth in the X-band radar market during the forecast period. The key drivers of the market in the Asia-Pacific region include the need to counter the rising terrorist activities and the various military equipment modernization programs, which propel the major defense manufacturers of the region to develop better techno-efficient X-band radars. Huge costs incurred in system development could inhibit the growth of the global X-band radar market in the near future. As radar systems are used for highly sophisticated defense systems, any incident of system failure is unacceptable. The radar system’s performance has to be highly accurate and reliable, and this is ensured by developing attributes such as durability, a wider detection range, and energy efficiency among others. The key players operating in the global market are Japan Radio Company Ltd. (Japan), Terma A/S (Denmark), Northrop Grumman Corporation (U.S.), The Raytheon Company (U.S.), and Saab AB (Sweden), among others. New product launches and contracts are the major growth strategies adopted by the top market players to strengthen their positions in the global X-band radar market, while also enhancing their product offerings. 12.7 Furuno Electric Company Ltd.
12.12 Reutech Radar Systems (PTY) Ltd.